Apparently, there are about 3900 denominations of coinage in this country. Some of it is worth quite a lot; well, 10 shekels. But some of it, just to throw you off, is worth almost nothing, like the ones that say "agorot" on them. Worthless. 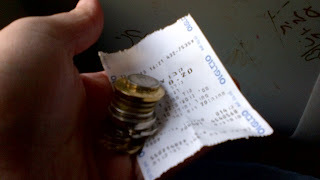 Here i am on the bus, trying to sort out how much i've paid and how much is left... Oy! Think of the agorot as cents. And the rule is that if a coin is partly or completely silver-colored, it's shekels. If it's completely brass-colored, it's agorot. The smallest denomination coin is the 10 agorot -- worth about 3 cents. Prices in stores may be something like 4.99, but the final bill must be rounded -- according to the law -- to the closest 10 agorot. @Eliyahu: Thanks for this tip about the colour of the money! I will also keep the rounding in mind... closest, up or down? Here, we're in the process of eliminating pennies, but I believe rounding must always be to the customer's advantage. Yesterday, I went to pay something and there were a couple of agorot that I stood stupidly trying to figure out how to pay until the cashier told me (body language) that we were done. Doh!